Structures within the anterolateral complex of the knee contribute, along with the ACL, towards rotational stability of the knee. Historically, extra-articular procedures were recognised to correct the pivot shift in the anterior cruciate ligament-deficient knee. A renaissance in the understanding of the anatomy of this region has lead to the development of additional techniques to reconstruct structures in the anterolateral complex. Biomechanical studies have shown that these techniques, in addition to anterior cruciate ligament reconstruction, can improve joint kinematics in the face of persistent rotatory laxity. 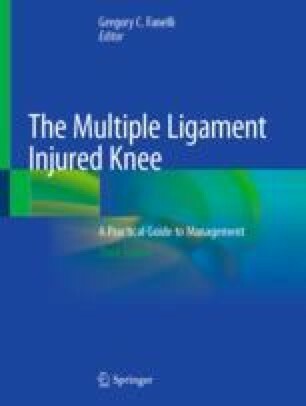 Application of these techniques to the multiple-ligament injured knee depends on a number of factors, but clinical examination, the exact pattern of injury and surgical expertise remain the most important. Anterolateral complex reconstruction is rarely indicated in more severe injuries and should be reserved for specific cases. AG receives research funding from ISAKOS and Smith and Nephew Inc.